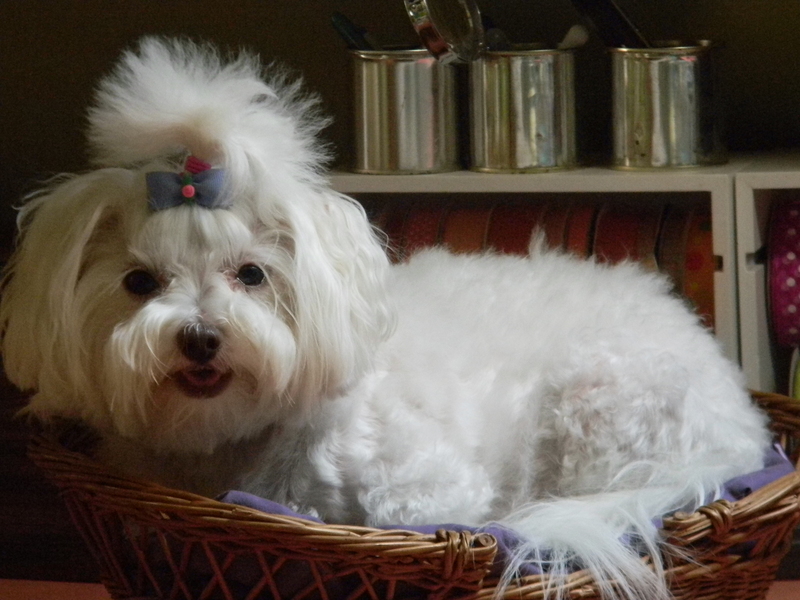 When I wrote about my Maltese Lucy loving our “master bath,” it occurred to me that I could do addition posts about our house and the stories particular rooms tell about my partner Sara and me. These, as well, I thought, could feature photos of Lucy and her canine, big brother Ralph—share the parallel experiences they have of those same spaces. 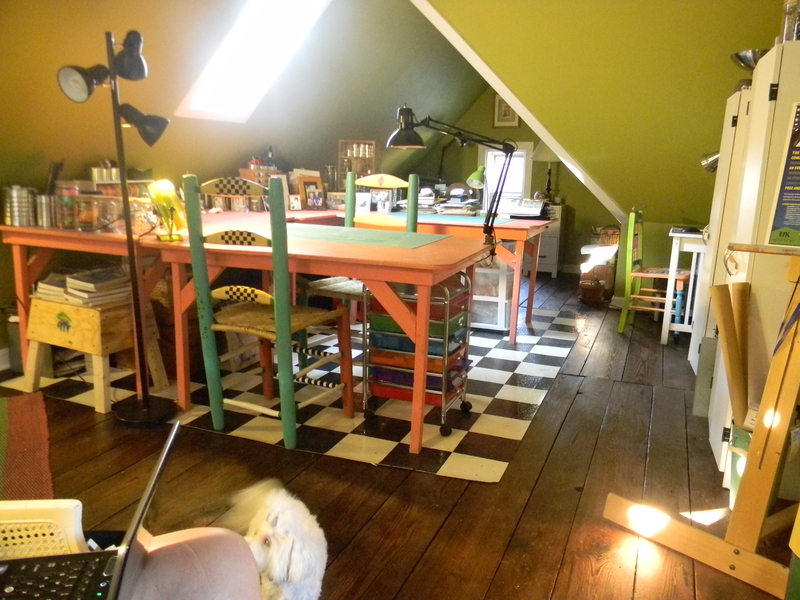 So, here we go—a post about my studio–images from Lucy’s perspective. "I supervise most studio activities--"
"Mommy claims the carpet was much worse than this photo shows." Before Sara or I were willing to live upstairs or even walk up there in our bare feet, it was clear the existing flooring had to go. 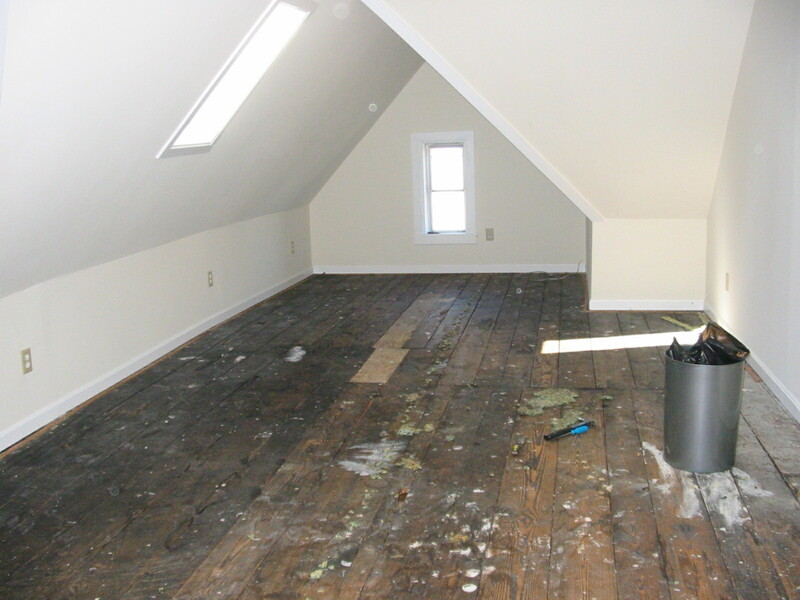 But when we removed the carpet, we discovered the most amazing wide plank pine floors beneath the sea of ugliness. They were themselves in semi-desperate condition and uneven as sailors’ teeth, but it seemed to us, a thorough hand sanding and waxing would bring them back to decency and then some. 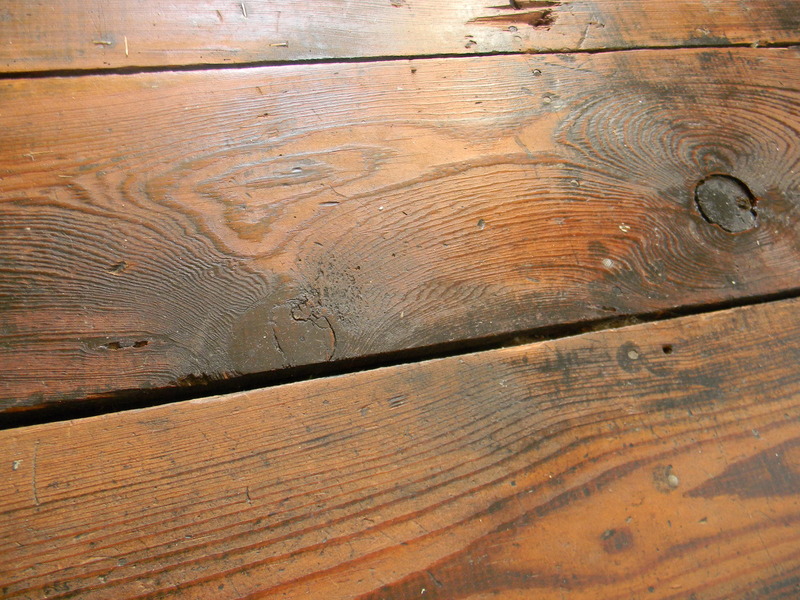 "She says the floors looked like this before sanding." "This is a massive improvement, according to Mommy." "'Primitive means they still have a story to tell.'" "Mommy says the black and white linoleum protects the floor, like a rug." "'Dirt from Haiti remains on the surface--impossible to get clean.'" "Mommy blogs from the chair in front. I like to sit with her." "Make sure you clean that brush!" "It's a lot of work, but somebody's got to do it." "Don't you love Mommy's chair?" "Mommy's always quoting that 'I-had-a-dream' guy." In the meantime, Lucy wants to know what places pets patrol in your home. Feel free to bark at her (or me) in the comments below. 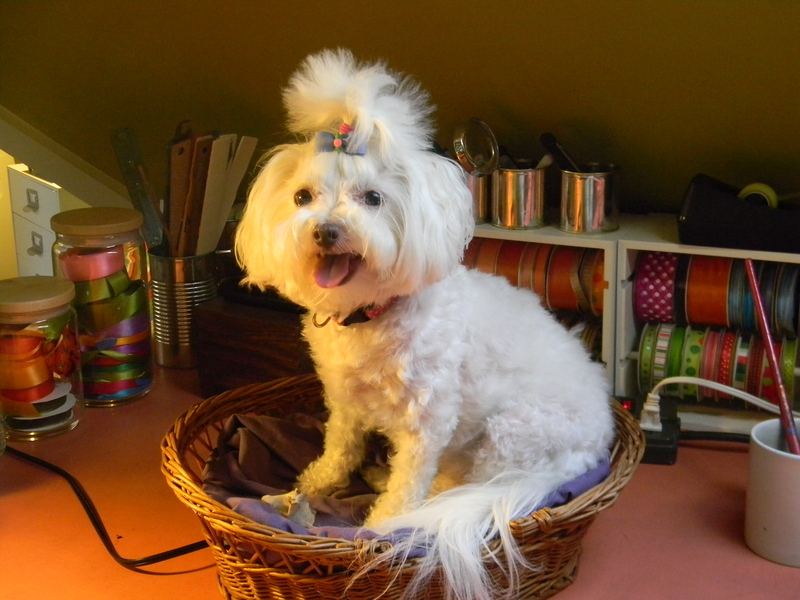 This entry was posted in art, Blogging/Writing, dogs, home, humor, pets and tagged Afghanistan, art, blogging, dogs, home, humor, life, Maltese, Martin Luther King, pets, photography, postaweek2011, studio, sustainability, Writing. Bookmark the permalink. Dear Lucy, I think you should surreptitiously move your perch away from those rolls of ribbon in case the tail gets it next! Penny–email me a photo, if you have one. I would love to see your baby! Aren’t our doggies daughters darling? I’m tickled that you think Lucy is cute–she’s dear, dear! I’ll be moving that perch asap! Lucy, your mom’s studio is amazing. Looks like a great place to hang out. I’m very envious of you both! Wow, this is my first ever comment on Mommy’s blog! Thanks for stopping by, Heather. We love that you love our space–the place where art happens–and I help! When not chewing entire doors or terrorizing the neighbors, Scout curls in a ball behind our toilet. Could she be any weirder? Dear Lucy, I will try to get my doggy pictures in order so that you can make virtual friends with my friends. 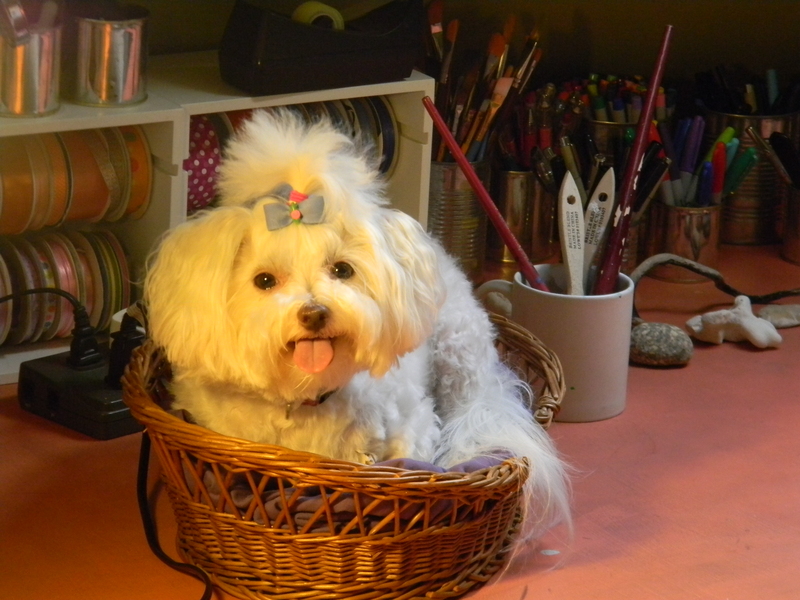 Kathy, in some of these pictures Lucy looks like a stuffed animal. it’s hilarious. I absolutely love and envy your studio and writing space. The floor looks gorgeous. Fun to take a tour with the pooch! A clever write up…enjoyed the post with photos. Thanks so much, Lisa! I’ll officially accept next week. Lucy is a little cutie! 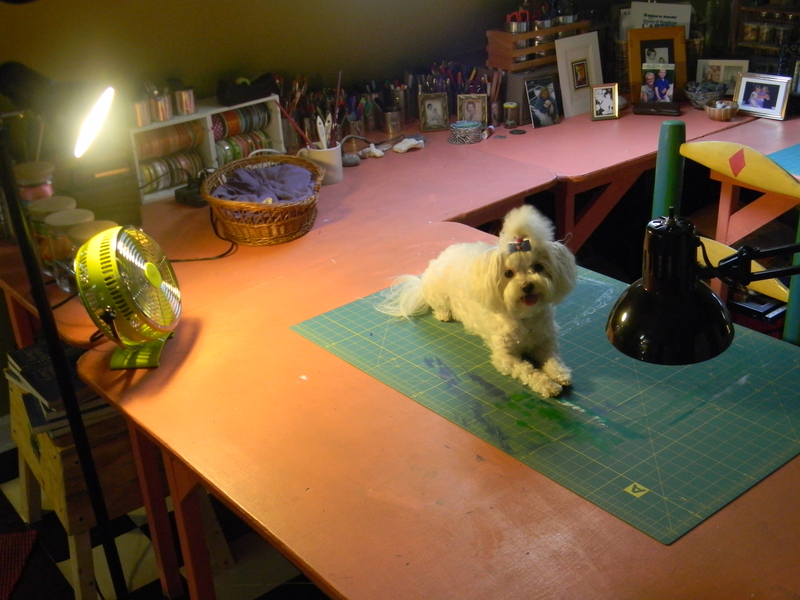 Thanks for sharing your creative work space with us, Kathy. What a fantastic studio! My dream is to have a writing room similar to that. Instead of the coffee table, where it seems I do most of my work these days. So glad you like my studio, Mark! 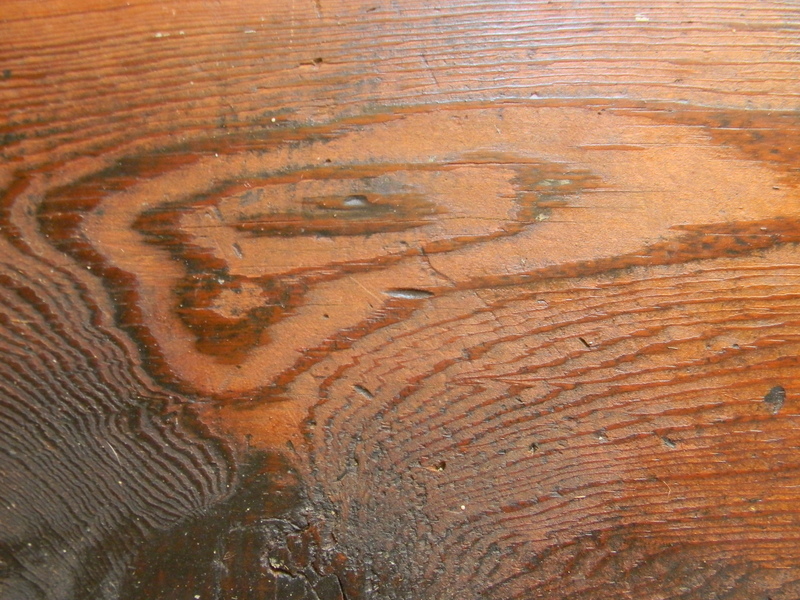 The coffee table is a fine place to work–but I hope a writing room is in your not-too-distant future! Happy Thursday, my friend! Lucy says to thank you, Tori. She may respond to comments, but she is a pooch who’s all about the pingback! She’s barking about it to brother Ralph as I type this! OMG, Lucy is *seriously( one of the cutest doggies I’ve seen. Kiss kiss! p.s. 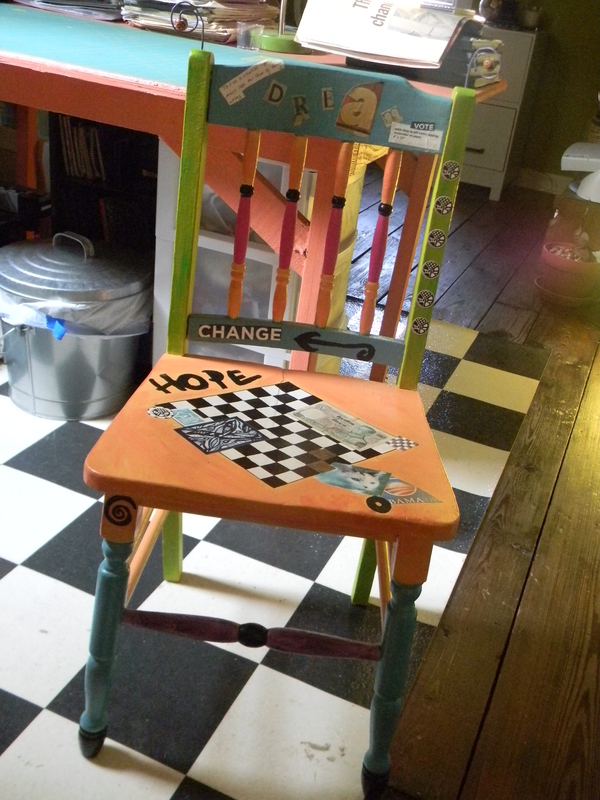 awesome studio, and I love the chair….decoupage? Thanks so much! I think she’s pretty cute, myself, but then I may be a bit biased! 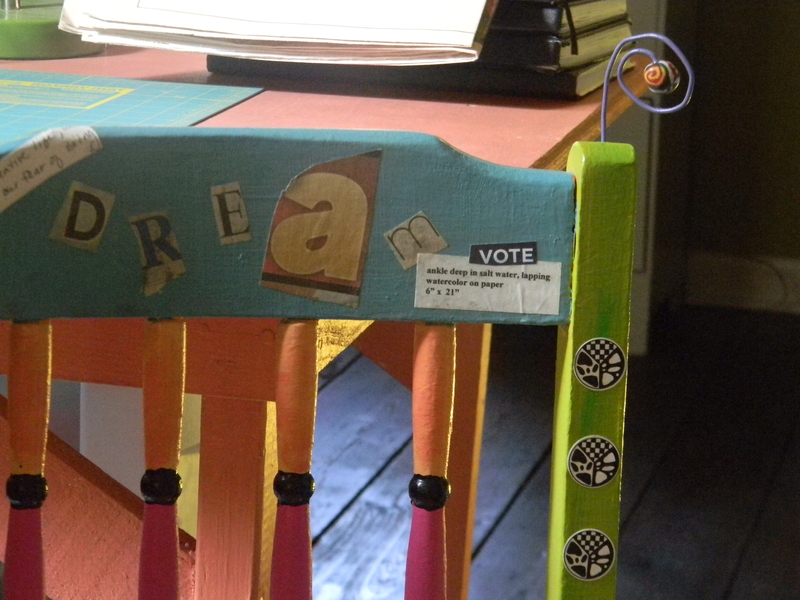 Yes, the chair is a combination of paint and decoupage. I’m glad you like it. The beads at the top are made from a polymer-based clay that I baked in the oven. Thanks for reading and taking the time to comment. It was great having you. Lucy and I both hope you’ll come back! What a cute, colourful space you got there Mommy! It’s right up my alley, esp the Haitian tables. And that floor looks great too. 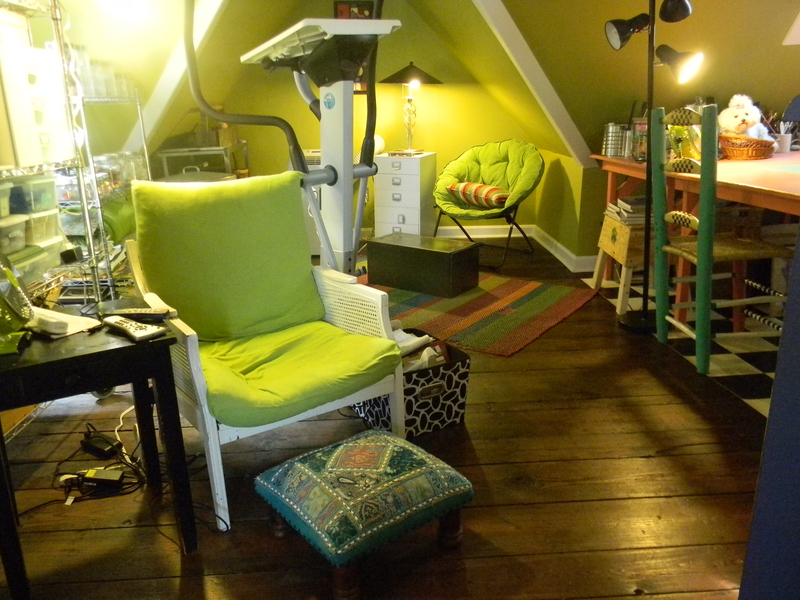 So do the writing nooks….gotta love the greenness and eclecticism! How fun that you noticed how colorful the space it! Green is my favorite, and Lucy seems okay with it too–that is when I’ve managed to keep the hair out of her eyes, so she can see. Thanks so much for stopping by and taking the time to comment! We hope you’ll come back! Are you kidding? I can’t believe I took so long to come and check out your beautiful blog! 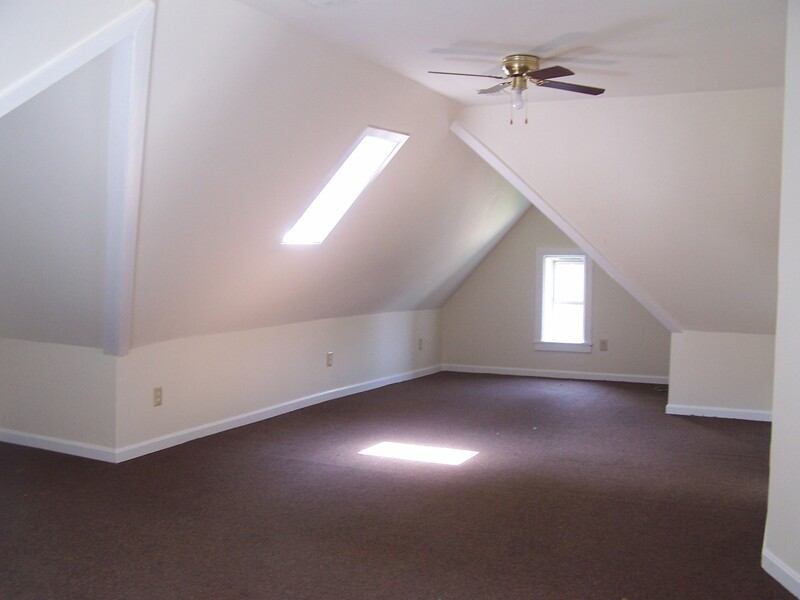 I think you guys did well in substituting natural light absence with bright pieces everywhere. So happy to stumble upon this blog. We’re so glad you enjoyed our post! It’s a great, creative space. And Lucy loves that you think she’s special! She’s a cutie, for sure. Thanks for reading and taking the time to comment. I hope you’ll come back! It was great having you! What a great post, Kathy! Sorry to have missed it the first time around. 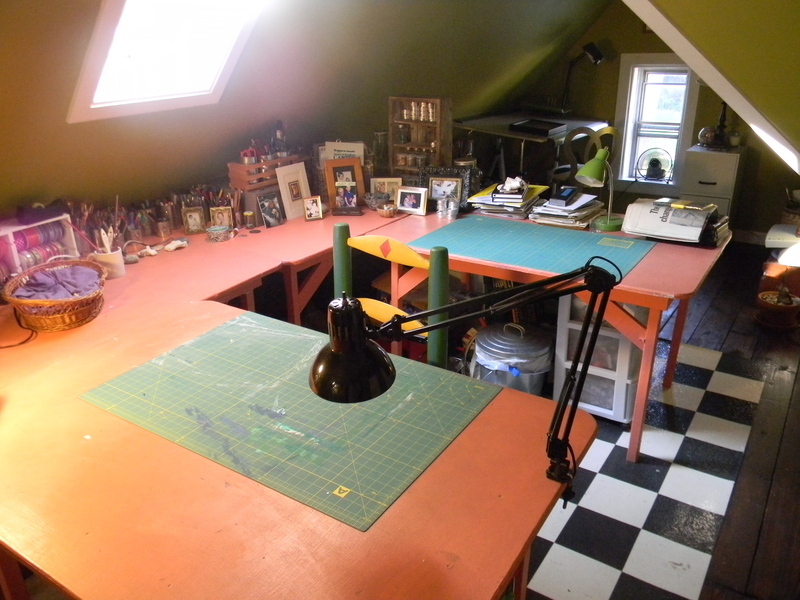 How funny–I too love photos of other people’s studios. Where does Marty work? But, I know–I have a great space. I’m fortunate. He works a lot outdoors at the Harbour, but otherwise he paints in what might as well be a storage closet. 😦 It is technically a bedroom with a full-wall glass patio door, but it has so many art supplies (and bike parts!) in it, that it doesn’t really make the greatest creative space. I hope Marty gets a great space sometime soon!